Most of the Harley Chopper/Bobber/Cafe Racer / Touring / Honda,Yamaha, Suzuki ,Kawasaki ,Custom bikes,Complete Custom Application, Modification May Be Required. Helps drivers receive better views and road reflections. Waterproof & Weatherproof and 100% Rust Free. Housing Size: 6” O.D. x 4-1/2” H.
Wires connection: Black for Negative, Blue for High Beam, White for Low Beam. Fitment: Most of the Harley Chopper/Bobber/Cafe Racer / Touring / Honda,Yamaha, Suzuki ,Kawasaki ,Custom bikes,Complete Custom Application, Modification May Be Required. The headlight can be converted to the high or low beam ,increase safety and visibility, this item will be your best choice. 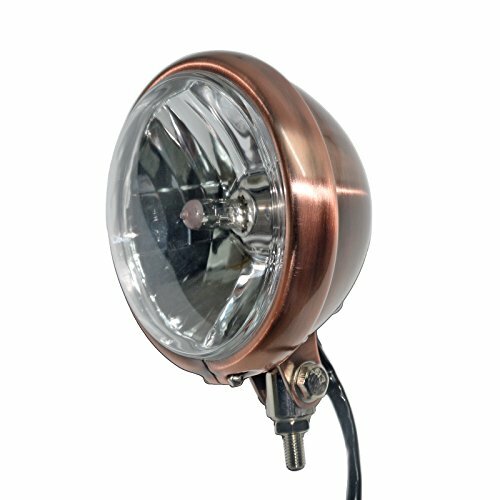 Bulb:H4 12V 60/55W ,Voltage: 12 Volts,Housing Size: 6” O.D. x 4-1/2” H.